Home » Join the Team » What is Playwork? Playwork is a highly skilled profession that enriches & enhances provision for children’s play. It takes place where adults support children’s play but it is not driven by prescribed education or care outcomes. work. Before you start, you’ll need a DBS and background check. You’ll support children to follow their own ideas and interests for play. You’ll make sure their are safe, interesting and fun play opportunities to meet childrens‘ individual and group needs. You’ll also follow health and safety procedures and help children to be aware of their own safety and that of others. You will help children to develop their physical, social, emotional and creative skills through play. depending on the locations and the type of activity. You could be based in a breakfast club, after school club, mobile play bus, or holiday play scheme. Your work will usually be very active, and you’ll join in with games and sports when you’re invited to. If you work part-time, you may be paid pro-rata on an hourly basis. What do we look for in our recruits? Playfulness - Do you get stuck in and involved in activities ? Ability - Can you supervise a group of children, as well as provide a playful environment? Career Progression - Can you demonstrate you would like a career in playwork? Reliability - Can we trust you? Teamwork & Flexibility - Can you cope in a fast changing environment ? Leadership & Confidence - Can you lead an activity or group of playworkers? 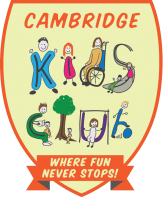 One of your core benefits of being part of Cambridge Kids Club is the training opportunities we can offer to progress your career in playwork. This starts with your extensive inductions process which including training in Playwork, Child Protection (including Prevent), First Aid and Food Hygiene. Once you have successfully completed your trial period you will be able to access our sweet of different training courses to develop your knowledge in playwork. We also offer more structured training programmes in the form of the NVQ Level 3 in Playwork. This includes either classroom based tutorials or online courses with observation and based assessments. We have also developed our own “Future Leadership Programme”. The aim of this programme is to develop play-workers to become future play-leaders, through a dedicated and specialised training plan, coupled with offering experienced senior team support and mentoring. The FLP is expected to last between 12 – 18 months, with the end goal of having the skills and experience required from a play-leader or deputy play-leader.